Potentiometry is used to measure electrolytes with ion-specific electrodes. There are two types of potentiometry: direct and indirect. Direct potentiometry: utilized by blood gas machines and does not involve sample dilution. Indirect potentiometry: utilized by automated chemistry analyzers, such as the ones used at Cornell University, and involves sample dilution before analysis. This distinction is important because endogenous interferents such as lipemia may falsely decrease electrolyte concentrations with indirect, but not direct, potentiometry. Monovalent ions such as sodium, potassium, and chloride carry a single charge, which allows R, T, n, and F to be combined into a single value called the slope (S). For measurement purposes with a chemistry analyzer, the sample is diluted 1:31 (indirect potentiometry), making the ionic strength and activity coefficient essentially constant. 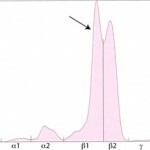 The concentration of the test ion in the internal filling solution is also constant. This procedure separates the proteins in serum and body fluids (e.g. peritoneal fluid, urine) into the component fractions – albumin and α-, β- and γ-globulins – based on their size, shape and charge. Electrophoresis is indicated for determination of the underlying nature of a hyperglobulinemia or if multiple myeloma is suspected in a patient. The types of immunoglobulin comprising a hyperglobulinemia can provide useful diagnostic information. It is less useful for evaluation of immunodeficiencies; individual immunoglobulin quantification by radial immunodiffusion or other techniques provides more information in these disorders. Serum is the preferred sample for electrophoresis. 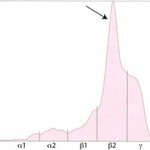 Fibrinogen (in heparinized samples) produces a monoclonal peak in the β region, which affects interpretation in plasma samples. Currently at Cornell University, we are using agarose gel electrophoresis for our protein electrophoresis. This is a very sensitive technique and splits the proteins into multiple fractions, which are species-dependent. For simplicity of reporting, we do not report out results for individual fractions, but those for combined fractions, e.g. albumin, α1, α2, total α, β1, β2, total β and γ. We provide intepretative comments on our electrophoretograms as well. We have established our own reference intervals for dogs, cats, horses, and alpacas, therefore abnormal results in these species will be flagged. In addition, we always provide the electrophoretogram scan itself, not just the written report. 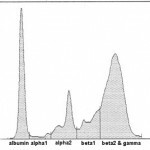 Albumin is the first and sharpest peak on the tracing. The acute phase proteins migrate in the α-and β- regions of the electrophoretogram and the immunoglobulins comprise the bulk of the γ-region, although IgA, IgM and specific subclasses of IgG can migrate in the late β-region. The shape of the electrophoretogram tracing and the quantity of protein in β- and γ-fractions, provides information about the underlying disease. In healthy animals, there is a mixture of immunoglobulins, which produces a small broad curve in the γ-region (see image to the right). Polyclonal gammopathy: Inflammation, infection or antigenic stimulation of any cause (e.g. chronic liver or dermatologic disease) can induce the secretion of mixed immunoglobulins, resulting in a large broad-based γ- region curve (see image below). This is called a polyclonal gammopathy. 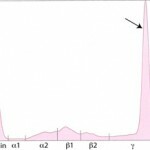 This pattern is frequently accompanied by a tall, narrow peak in the α-2 globulins, due to increases in acute phase proteins. In these cases, measurement of the specific immunoglobulin classes with RID is not indicated. In these cases, measurement of the involved class of immunoglobulin by radial immunodiffusion (RID) or other technique is indicated since it does provide additional information. B-cell tumors usually produce IgM or IgG monoclonal gammopathies, whereas IgG or IgA monoclonal proteins are typically secreted by plasma cell tumors. Furthermore, the uninvolved immunoglobulins are usually decreased (secondary immunodeficiency) in patients with these neoplasms. “Split monoclonal” gammopathy: This term is applied when two monoclonal peaks are present (see image below). In our experience is usually due to monoclonal IgA (which can dimerize). In rare cases, this can be due to the secretion of two different immunoglobulins, i.e. a true “biclonal” gammopathy. Therefore, RID measurement of the involved immunoglobulin classes is useful in these cases. “Restricted oligoclonal” gammopathy: This term is applied to a tall narrow “monoclonal-like” peak superimposed upon a broad “polyclonal-like” base (see image below). We see this pattern frequently in dogs and cats with immune-mediated, infectious or inflammatory conditions, e.g. severe lymphoplasmacytic stomatitis, Ehrlichia canis infection. It is caused by the stimulation of specific B cells resulting in secretion of a few, restricted classes of immunoglobulins. However, this type of electrophoretogram could also be due to a neoplasm of lymphoid cells in an animal with concurrent antigenic stimulation. Measurement of specific immunoglobulin concentrations is helpful for distinguishing between these possibilities (as is infectious disease testing and diagnostic tests for underlying disease). If the immunoglobulins are mostly IgG, with increased or normal concentrations of IgM or IgA, a “restricted oligoclonal” gammopathy due to infectious, inflammatory or immune-mediated disease is more likely than lymphoid neoplasia. Electrophoresis can be performed on body fluids. This is usually done in cats with abdominal effusions to support the diagnosis of feline infectious peritonitis virus (FIPV) infection. In this disorder, an exudative effusion can develop in the abdomen, which mimics the serum results. Therefore, serum and fluid should be submitted concurrently. Both usually show an increase in α globulins (acute phase response) and a polyclonal gammopathy. An increase in γ globulins in the fluid is specific for FIPV infection. Electrophoresis can also be done on CSF samples, however this is not done routinely because large volumes of CSF are required. The protein in CSF is usually too low to run on ELP without concentration. Concentrating CSF requires at least 5 to 10 ml of fluid, which cannot be obtained from many animals. Electrophoresis can be performed on urine, but similar to CSF, this requires concentrating because protein values are usually quite low in urine. Luckily, we can obtain sufficient urine (10 ml minimum) from most animals to perform electrophoresis. Electrophoresis on urine is the preferred technique for identification of Bence-Jones proteins (free monoclonal light chain) in patients with suspected multiple myeloma. It should always be done in conjunction with serum, so the results can be compared directly. Other people have performed urine electrophoresis to distinguish between hemoglobinuria and myoglobinuria (however the distinction is subjective and fraught with complications) and to gain insight on mechanisms of proteinuria (however we recommend that a urine protein to creatinine ratio is performed concurrently to facilitate interpretation oft he latter samples).